"OW IIx" (x added in 2009 when OWII was slightly upgraded to more linear performance in the upper freq area). 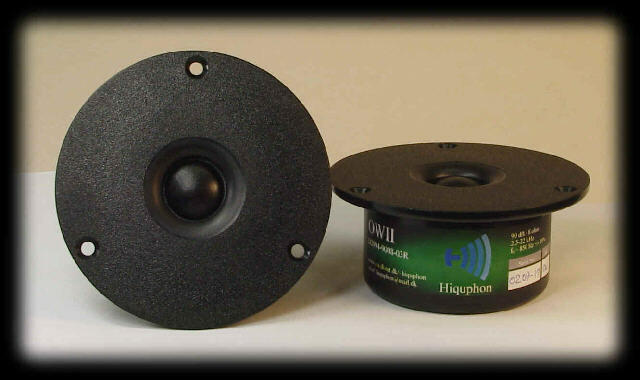 Soft dome tweeter (3/4") offering unique analytical capability and a high sensitivity. Also including one of the finest dispersion characteristics possible. Well suited for speaker systems using equal high-quality midrange or mid/bass with a suitable matching sensitivity. Unique stereo perspective, as they come in matched pairs selected within 0.5 dB throughout 2-20 kHz. Excellent choice for 3 way systems in general. Also a fine choice with 2 way systems, if mid/bass is broad-banded enough to fit into the shape and level of the tweeter frequency response. Originally designed for domestic speakers but now widely used in carfi as well! Also used with great success in music studios.